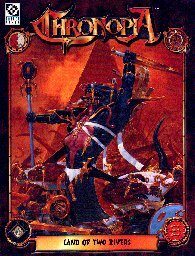 Chronopia rules supplement. 96pp full colour. Cover Land of Two Rivers Chronopia is the latest addition to the growing stock of products from Target Games, and was the first written in their design studio in Edinburgh, Scotland. The game is good value for money and as some really good points and like all systems bad points too (check out the link for a full review!) and it was only a matter of time before the first supplement for Chronopia hit the stores. I was amazed at how quickly Target had turned around this product as I was at the studio during December last year and it was only part finished then ( all the terrain was built by me and Jerzy Montwill did the palm trees!) and only a few short months later the finished product is out. Graced with an excellent cover by Targets resident artist Adrian Smith, Land of Two Rivers tells the story of the Firstborns (humans) struggle against a foe that has lain dormant for thousands of years! The supplement brings us a complete new race, the Stygian, and extra rules for the existing races. Out of the 96 pages of full colour text, over half of them are devoted to the background and history, with the rest making up the extra rules, and troop types. The background written by Pete Flannery is very well written if a little disjointed in parts and add pathos to the already existing history in the Chronopia rule book, but bears more than a passing resemblance to the works of Michael Moorcock and Robert E Howard. Given the huge amount of background that is needed in a new system, I feel that perhaps too much was crammed in to far to little space, and even though the book doesn’t suffer for it, a few more pages would have perhaps made it look less crammed. The main premises of the Two River supplement is to introduce a completely new race to Chronopia, the Stygian and this it does excellently. The Stygian are the Lizard men of the Chronopia world and true to its form are not a blatant rip off of other companies ideas, but are a unique race unto themselves. More like an alien race than a race of lizards, the Stygian act with an almost hive mind mentality and know no fear. They overwhelm their enemy and throughout the book the reports of the battles against them are illustrated. Perhaps what makes them such a fearsome opponent to face is the fact that they care nothing at all about the individual and only are concerned about the collective as a whole. Led into battle by fearsome Warriors and snakelike Priestess´s, they mass around their foe and attack with close quarter weapons as they don’t have missile fire at all. Unbreakable in combat they will fight almost to the last or till evening wears on and they are forced to retreat as they are a cold blooded race. The extra rules given in Two rivers cover everything from Troops and weapons to spells and even climatic conditions. Fighting against the Stygian is a difficult task in its self, but when one faces them on their own turf in the desert it becomes a lot harder! The Stygian are like most of the troops and races in Chronopia well balanced, and the high costs of some of the troops is made up by some of the special abilities that they possess. The book is once again filled with lavish full colour artwork by Adrian Smith, add more to the fact that he is among the best fantasy artists in the hobby. Dozens of photos of the studio miniatures litter the book, and show off the painting talents of Mark McNaught and Jackie Prow excellently. I was amazed at how good the terrain I built looked when I saw it in print and the miniatures look really in context on it! There are a few gripes to be found though! As stated the background seems too cramped and takes up more space than the extra rules, some of the background does not make sense when first read and some of the words even had me consulting a dictionary for meaning, so what would the average gamer make of them? But all said Land of Two Rivers is a very good outing for a first supplement and I look forward to the next book, The Sons of Chronos, due out later this year! Once again a big thanks to Roger and all at Gamecraft for supplying me with the sample book.